Sound the horns! 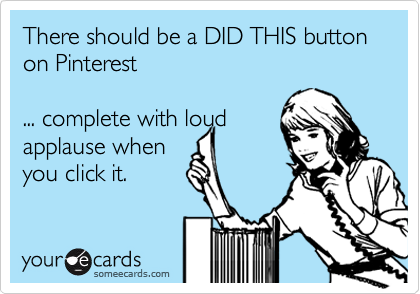 I actually created a project that I pinned! If you’ve been following for over a year, you might remember that my big project last March was my pantry makeover. If not, you can check out the before/after pictures here. 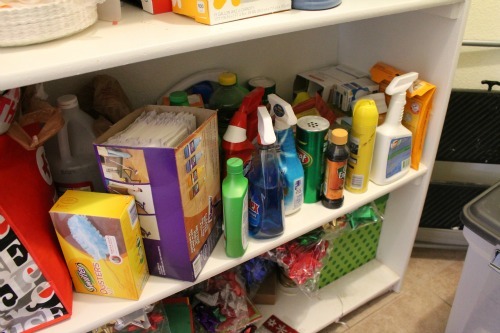 I never completely finished my to-do list (big shocker, I know), but now I’m back, a year later, with a pantry project. 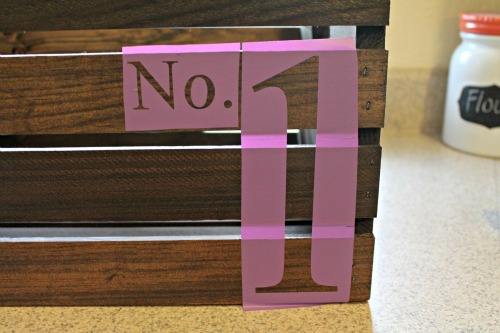 Not only are they cute (and functional), they are also cheap and easy to make! The crates are regularly $11.99 at Joann’s, but are only about $7 after your handy 40%-off coupon. I lucked out and got a 50%-off coupon in my e-mail, so I only paid $6.53 (including tax) for my crate. 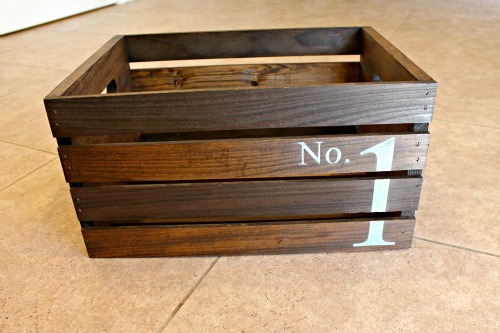 I stained the crate Dark Walnut, which I already had on hand. Then I used my Silhouette to cut out the letters and number. I used some CraftSmart Robin’s Egg Blue that I had leftover from my painted pot herb garden to paint the letters and numbers. I only did one coat of paint and then removed the vinyl stencil as soon as I was done painting. After the paint dried I lightly sanded it with very fine sandpaper. This is a great way to make it look more aged and hide any mistakes (paint bleeding under the stencil, brush marks). I love how it turned out! I’m already planning another trip to Joann’s (with another coupon) to buy one more crate for the pantry! And here’s how it looks with my new crate! It definitely looks more organized and less cluttered! 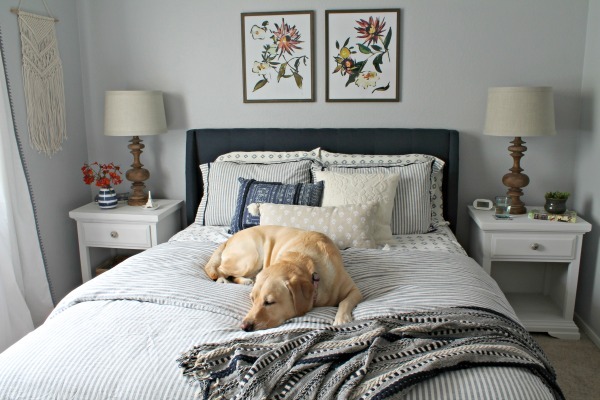 Thanks Kelli for sharing such a great find and an easy transformation! 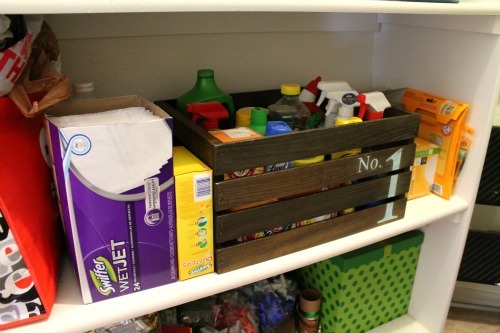 You can see Kelli’s crate project here and her amazing craft storage system here. This is so beautiful! I love the dark walnut stain too and how it's darker every other piece. Did you mean to do that? And I've seen these crates at Joann's so many times but haven't bought one yet...thanks for showing me how adorable they look painted!!! The wood on every other slat of the crate had a different texture (one was smooth and the other rough), so they stained differently. It was a happy accident! PS. 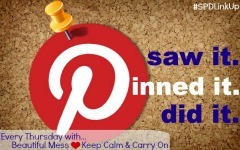 I heart new background... new sign thingy... and new button. Eek!! 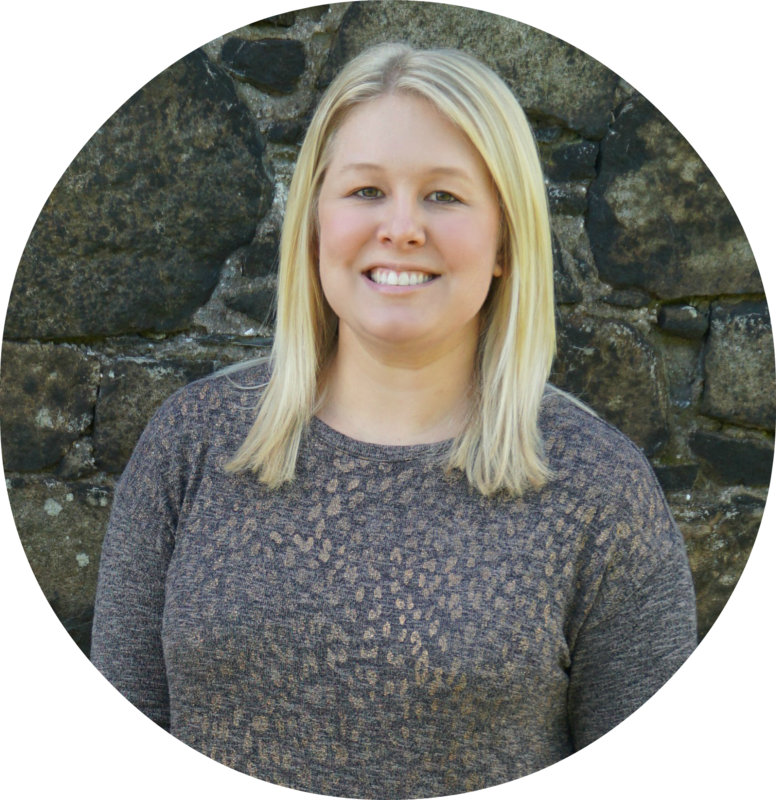 You changed your blog design! I love it! The little house on top of the h - adorable!! Wow! Your project looks like an exact replica of the original pin! Mine rarely turn out like the original :) I love this idea for organizing, I think they would look great in my laundry room. I am hosting a friday favorites link up tomorrow at my blog, createdbysk.blogspot.com, and I would love if you considered linking up. 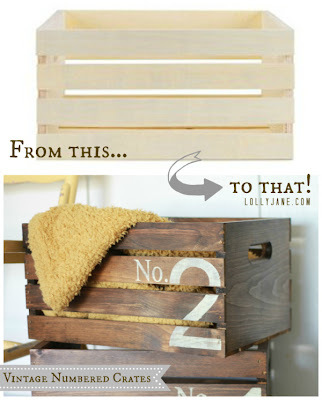 Love the idea of using the crate to organize!! Thanks for sharing this fun project! What is this silhouette that you speak of???? I'm in lurve!!! Adorable! I should make one of these.